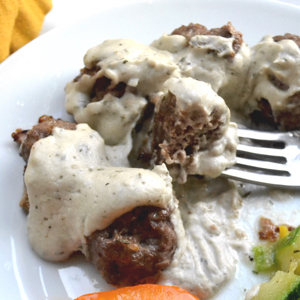 This comforting dish — Tarragon-Dijon Meatballs with Garlic-Tarragon Gravy — is definitely inspired by my Southern roots. Yet it's a bit more refined, in my opinion. Combine all ingredients in the bowl of a stand mixer and mix until all ingredients are completely incorporated.